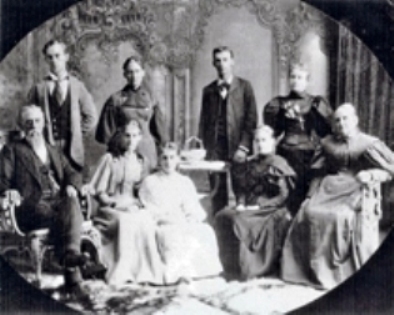 Seated on the left is Jerome Bonaparte Armstrong Sr.
Jerome's wife Louisa Henrietta (Hoag). Seated in the center is daughter Louise. 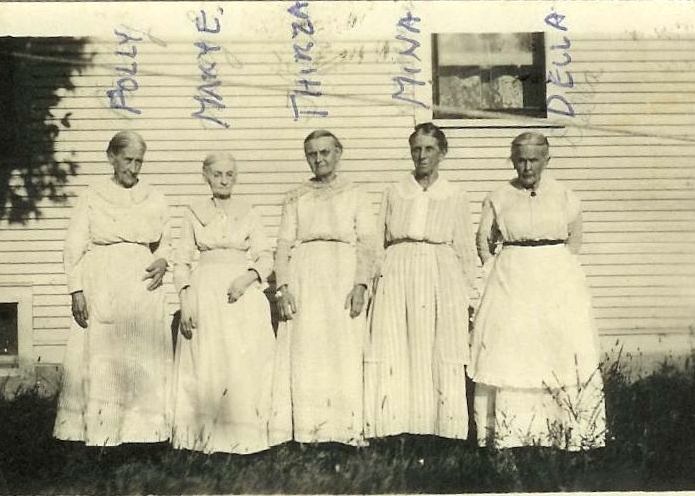 This picture shows my great grandmother, Mary Elizabeth (Libbie) Dunton, with her sister and several cousins. 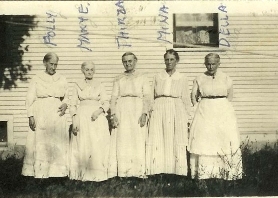 From left to right the "girls" are Polly (referred to as Aunt Polly Folts in other pics), Mary Elizabeth Dunton (my great grandmother), Thirza (Snyder, McKimm, Delano), Mina (Sometimes called Mina Pickel and then Mina Smith. She lived with the family when they were in Kewaskum, but didn't move with Thomas to Clark County. Later records suggest she married and settled in Iowa.) and Della (we think Reynolds - the Michigan connection) She and her husband also lived for a while in Kewaskum. Mary Elizabeth died in 1920. I think the picture was probably taken in the early 1900's. Place? - either Campbellsport, my dad's hometown near Kewaskum, or it could have been taken in Clark County perhaps in the town of Humbird which is where they seemed to congregate. My grandmother and her mother often traveled there by train. I like this picture. It's full of pioneer spirit!